2048 * 7 is... ? I haven't finished Fairy Tale Puzzles ~Magic Objects~ (Adore Co./Office5656) on Switch. I don't think I will either, since I'm not very good at this type of games. 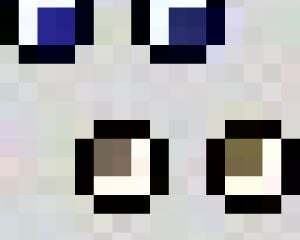 But I'm pretty confident I've seen what the game has to offer mechanically in the maybe five hours I've put into it. For those who aren't familiar with 2048, it is a game played by four direction keys. The whole playing field is a 4x4 grid, and an item of various (low) value is placed there after every move. By pressing one main direction, the tiles will fall in the stated direction and if there are two tiles of equal value stacked, they are merged into a new tile with a grade higher value. So 1+1 become 2, 2+2 become 4 but 1+2 stay as separate tiles. 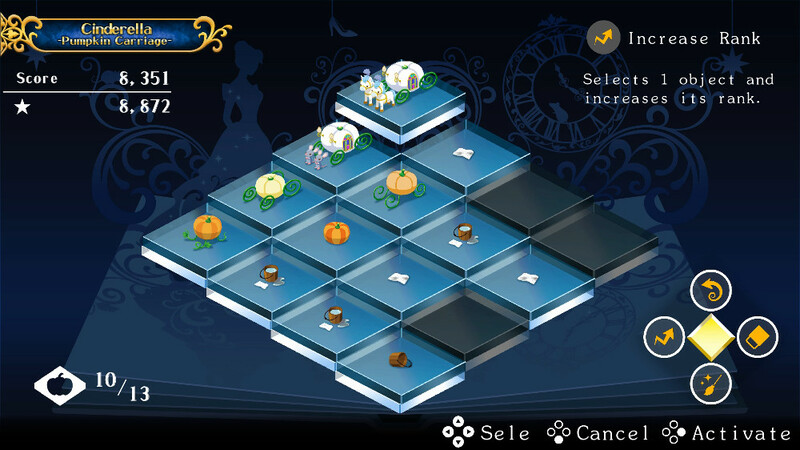 Fairy Tale Puzzles is 2048 in seven levels. 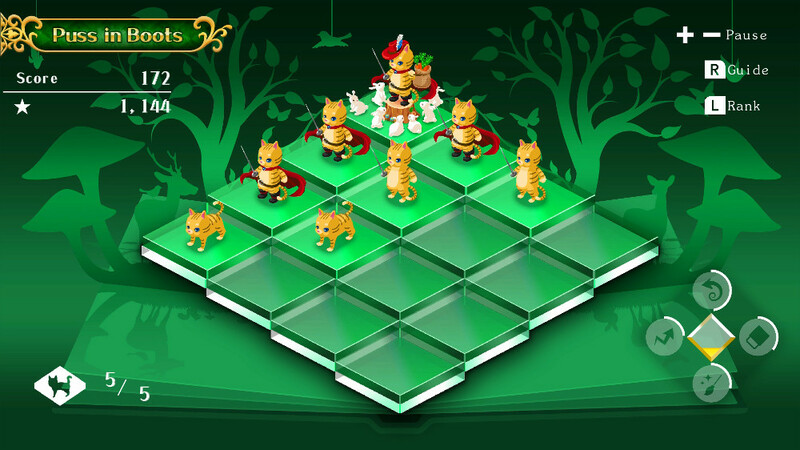 Each level has a different tileset based on a fairytale: Puss in Boots, Aladdin, Snow White, Cinderella and so on. Each level also has a different "maximum level" after which the tiles can no longer be merged. 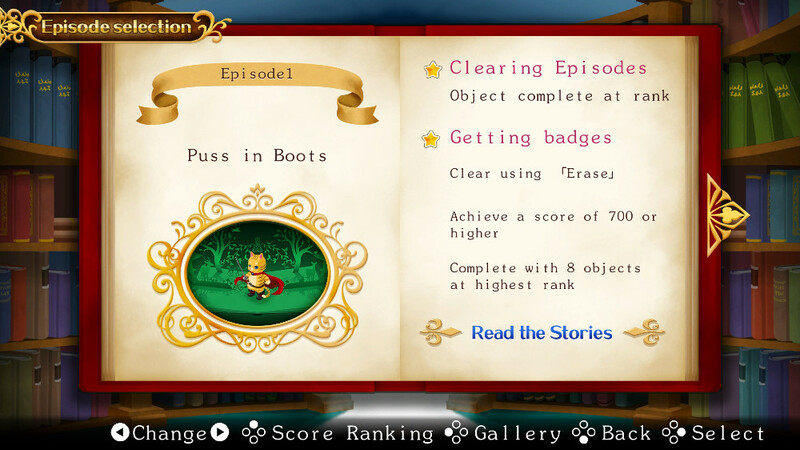 First episode, Puss in Boots. The big change is that there are four special powers that can be used after they've recharged, and these will make the game a lot more forgiving: reverting the previous move, upgrading any one piece except those at top two ranks, removing low-ranked tiles and removing any non-top-rank tile. However, the localisation is lacking. The font is overly wide, which means not everything fitting on the screen. For instance, "Select" prompt is cut to mere "Sele". Worse, though, is how the episode goals do not show the top level of the tiles. Sure, the only thing that is probably missing is the top rank of a tile in that episode, but it's still unprofessional. Coincidentally, this is the last stage I've managed to reach. The top level of 13 equals, I think, getting 8192 in 2048. So I'd better use the special powers. On the graphics and sounds... the graphics are nice, but the only animation is the stretch/squeeze/shift of the tiles as they are moved or merged. So every cat in the Puss in Boots -episode is an immobile statue. I was pleasantly surprised that each level has their own music. The music isn't memorable or hideous, but the pieces fit in the background and the general theme well enough. Beyond that, there aren't many more features. There are online leaderboards and a "badge" for each level the player can earn by meeting a set of goals, but that's it. Despite the menu saying "Read the Stories", it only starts the puzzle. I don't think these work as story illustrations outside of maybe Cinderella (rag to a bucket to a water-filled bucket to a pumpkin to more and more elaborate pumpkin carriage). All in all, the offering here is a reskin of 2048 with some additions to the game mechanics. 2048 is still addicting and it is free, but it also looks minimalistic. If you think the graphics, a slight change of mechanics and music is worth 10€ (or 5€ during the launch discount), you might be happy with this.